A month or two ago I took a look through my fabric stash and found this festive Halloween print. I used it for a craft project almost 20 years ago, and had about a yard and a half left. There was clearly no other option but to make a skirt. So I did! I wore it to work today. The pumpkin/moon pattern is cute, but the texture of the fabric isn’t all that enjoyable – it’s a cotton that’s just a tiny bit too stiff to be really pleasant. Because of the texture, and the fact that I was working on numerous other sewing projects that were much more demanding, I chose trusty old New Look 6354 because I knew I could whip the skirt out in no time. And…voilà! I look extra goofy in that shot because both my photographer and I had spent the last few hours at the office eating far too much candy. She finally had to put the camera on a table because she was too sugared up to hold it still. But we were both very happy, if a bit less productive than usual. I’ve been studying Italian, which is a slow process because I have so little time…until I came up with the idea of combining Italian and sewing! Now I can study while I sew, and sew while I study – how awesome is that? I figured a book that covered the basics would help me learn sewing terms in Italian more quickly than looking each up as I ran into it. This book is actually a translation of A to Z of Sewing: The Ultimate Guide for Beginning to Advanced Sewing, so if I get really confused I can always get a copy in English. My next thought was to look for sewing blogs written in Italian. So far I haven’t found any, but my search did lead me to Anna’s blog Paunnet, which was a total score. 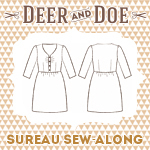 Her blog is a treasure trove all on its own, and on top of that she’s introduced me to Deer and Doe so I’ve joined yet another sew-along! Of course, this means I have not only added another project to my very large list, the pattern is in French and I’m supposed to be learning Italian. Incroyable! The third and last component of my Italian/sewing plan was to find at least one sewing magazine in Italian. I found La Mia Boutique mentioned on several sites, including this post by Sewingplums which provides links to a variety of independent pattern companies as well as to pattern magazines written in multiple languages. I figured subscribing for a year would at the very least mean I’d feel guilty about not studying when each new issue arrived. My first issue (October) arrived about 2 weeks ago, and so far it’s been quite fun. Paunnet posted a detailed look at the patterns in this issue, and I completely agree with her assessment: not only am I unlikely to want to wear, much less make, most of what is in this issue, it’s a challenge to picture anyone else doing so either. That said, there are several patterns that I do like, and since my goal is to learn I’m actually going to try to make something from one of them. I decided to start with a blouse. The pattern is actually for a dress, but I’m not a fan of it from the waist down, and it looks like it should be easy enough to turn into a blouse. Maybe. I’m going to use the first fabric I purchased for my Peony dress which I’m making for the Sew Colette 2.0 Sew-along. (I’m having a terrible time settling on a fabric for that dress…but on the plus side, I’m rapidly adding to my fabric stash!) It’s a silk-like fabric made from 100% polyester. Obviously NOT the right choice for Peony…but it should work well for this blouse. I had no idea what to expect from the magazine, since I’d only seen bits and pieces on other websites. The patterns come stapled in the center. Each piece of paper contains shapes for multiple patterns, with different color lines indicating which pattern is which. My pattern pieces are outlined with green, and while this seemed crazy at first – in a colorful way – it’s actually pretty straightforward. I’m a recent tracing paper convert, although I have yet to confess that to my sewing instructor (hi Mom! ), so I’m actually looking forward to tracing my pattern pieces. Thanks to Gertie I started with Swedish tracing paper, which I love. In fact, I love it so much that I can’t bring myself to try out anything else. I’ve got my dictionary and optimism ready – buona fortuna a me!!! I love polka dots. And I love pajamas. What could be better than polka dot pajamas? The last time I’d made pajamas was about 10 years ago, and as I’d tossed that pair years ago after the fabric had worn thin I couldn’t review how well they’d turned out. I did remember that I’d had some issues with the pattern (Simplicity 9329), although so much time had passed I couldn’t recall any details. I saw a reference on someone else’s blog (I can’t remember who) to McCall’s M5248, so I decided to give it a go and then compare the two patterns. The new pattern worked pretty well right out of the gate, except that it was a bit too high in the waist. Two inches too high. I even made a muslin (I’m getting muslin-happy – who makes a muslin for pajamas?) and didn’t even think to look at the waist. I had no idea there was a problem until I tried them on – after sewing the waistband and threading the elastic and ribbon through. Oops. Fortunately my sewing shears are nice and sharp, so I hacked two inches off all around and stitched everything up again. The pattern calls for a self-fabric drawstring, but that didn’t seem as fun as a piece of ribbon. I used double-sided, 5/8″ ribbon. I also threw in some elastic, because who wants their pajama bottoms to fall down? Besides, this way I can leave the ribbon in its nice, neat little bow. The Simplicity pattern calls for two holes for the drawstring, but the McCall’s pattern only has one and that seemed odd. It works just fine, but the way the fabric folds means it’s a fun task to thread everything through. To be fair, it was a lot easier with the first waistband – by the time I’d sewn that, chopped it off, and then worked the elastic through again, I was a bit cranky. (The ribbon and elastic had been pinned together, but decided to part ways somewhere in the depths of the waistband.) Fortunately my handyman stopped by and saw my plight; he worked the ribbon through in mere minutes with the help of some wire and duct tape. Here’s a close-up so you can get a feel for my reaction when I realized I’d lost the ribbon. It turns out that hacking 2″ off all around wasn’t the best plan. I should have tapered the cut – a little more in the front and a little less in the back. They fit okay, but could be better. I’m going to modify the pattern accordingly and see how the next pair turns out. I do still want to try the Simplicity pattern, but I appear to have embarked on a quest for the perfect pajama pattern, and like any quest there promise to be many adventures and misadventures along the way. In the meantime, while they’re not perfect, this pair is comfortable and super cozy. And yes, that is a Lucy shirt I’m wearing!